You are here: Home / Commodities / Silver on the Edge! 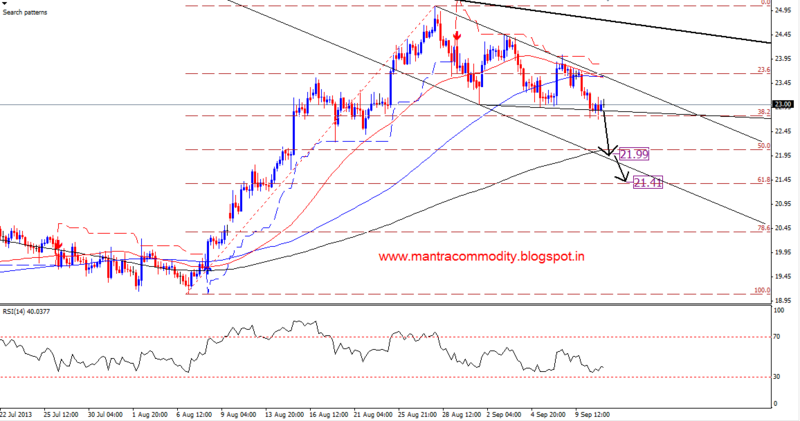 Silver (11.09.2013) traded lower after placing fresh high around $25 & now a corrective wave is under progress. Now silver is trading around $23 mark & we can see on charts, silver is moving under a descending wave after kissing the long term descending trendline.This downside move can is also limited by an triangle pattern which is an non-ideal pattern with higher rate of failure. The edge of the triangle also in combination of 38.2% feb correction level, a break below which may generate fresh selling. Continue structure of lower higher-lowers lows indicate the same. Based on above studies, we will prefer to sell silver with a clear break below $22.87 for possible targets around $22 & then $21.41. Only a break above $23.58 will reject the forecast. Nifty At All time High – Will it Push Up More? Nifty once again made a fresh All time intraday high 7918.55 however still Bank Nifty struggling near the previous all time high 15742 made on 16th May during Election Results 2014.